I am a proud member of Leadership Palm Beach County, Class of 2015. Part of the LPBC curriculum is to participate in a civic engagement project. 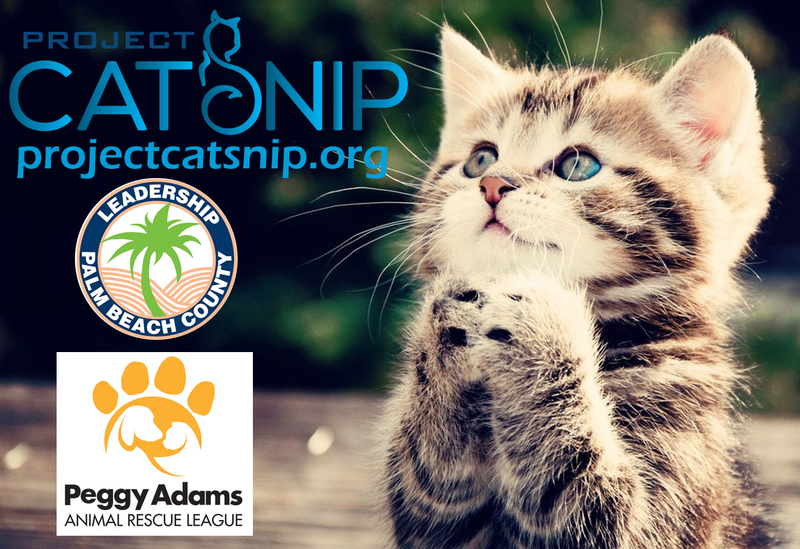 The project I selected is Project Catsnip, a public awareness effort in conjunction with Peggy Adams Animal Rescue League. I did not realize this, but one of the biggest problems of animal overpopulation is the cat reproductive cycle. One female cat can start reproducing as early as six months old and will have up to three litters a year. Just one female cat can have as many as 120 kittens in her lifetime. Multiply that by a colony of 10 female and 10 male cats and the overpopulation rate is out of control in a short period of time. I have put over 30 hours filming these cats and interviewing the folks at Palm Beach Animal Control, Peggy Adams, and other concerned citizens. We filmed all the footage you will see in the video below. Project Catsnip helps to educate the public about the importance of TNVR in our community. This is trapping, neutering, vaccinating and releasing community (feral) cats. Last year Palm Beach County destroyed over 7,000 cats of the 10,000 processed by Animal Control. Each cat, whether rescued or killed costs the County at least $400 per cat. High sterilization rates in targeted colonies will drastically reduce this problem and ultimately lighten the burden on tax payers in Palm Beach County. To be honest, I am not a big fan of cats. But once I appreciated the import of this problem, I realized the goal was attainable and I could do something about it. I would much rather spend millions of dollars a year building dog parks then spending it on killing cats. If the cat killing people worked 365 days last year, they would have killed 21 cats a day last year. I have no idea how many days a week or a month the cat killers work in Palm Beach County, but assuming they do not work every day of the year, the numbers of cats killed in any sitting is pretty high. Then I met my teammates; Pam Figoras (Mental Health Services, Community Partners / Parent Child Center), Lili Finke (Senior Manager of Organizational Development, Palm Tran), Deana Mccrea (Director of Accounting, Florida-Carolinas, CEMEX), Kevin Murray (Director of Community Relations, Opportunity Early Learning Center), Pam Saratory (Business Manager, SunFest of Palm Beach County Inc), and Debi Willard (Director of Marketing, Gulfstream Goodwill Industries, Inc.) and realized the unlimited potential we had to make this project a success. It’s a cool think tank and the spectrum of talents and personalities has really made this a fun project to work on. It is our hope that through efforts like this, Palm Beach County can reach their goal enumerated in Countdown to Zero; to end the killing of adoptable animals by the year 2024. So… if you would like to assist Peggy Adams in meeting this goal, then please consider making a tax deductible donation to support this institution. I can give you 2 good arguments, 1) i think you agree it is a worthy cause, and 2) you would be supporting me! While we have never charged you for the materials contained in this website, we do bug you from time to time to support causes we think are worthy. This is one of those times. So I challenge you to do something that matters and support Peggy Adams! Also, we are participating in Peggy Adams Walk for the Animals 5k on March 7th in Palm Beach Gardens. We hope to see you there! p.s. If you are interested in Leadership Palm Beach, which I HIGHLY recommend, they are currently accepting applications for the Class of 2016. For more information on our project visit www.projectcatsnip.org.